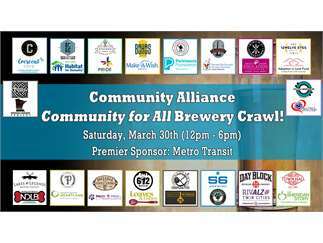 Join us Saturday, March 30th (12pm - 6pm) for the first annual Community for All Brewery Crawl! Raise money for local nonprofits, while enjoying great craft beer! $15 of your ticket is donated to your favorite charity. The self-guided crawl will be a day of fun at over 15 of the best craft breweries in Minneapolis, St. Paul, and beyond. Hop on our FREE shuttle bus to travel between NE Mpls breweries or North Metro breweries and use your complimentary Metro Transit Pass to visit breweries on the Light Rail. Each brewery will host a local nonprofit. There will be games, prizes, giveaways, and specials throughout the day. Your crawl will begin at the brewery/nonprofit you choose during checkout (tickets are limited at each brewery - purchase early to confirm your space). 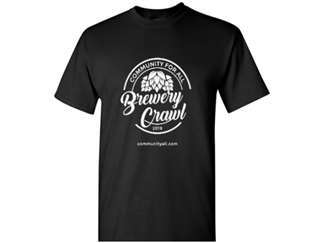 Check-in with your nonprofit to receive your "Crawl Pack" - then hop between breweries drinking great beer and supporting local nonprofits!